The Big Wobble: Thousands of dolphins killed this year by "industrial trawling" along the coast of France accelerating the extinction of the species . Thousands of dolphins killed this year by "industrial trawling" along the coast of France accelerating the extinction of the species . About 3,500 dolphins have died this year in the waters of the Atlantic, a veritable massacre that is expected to increase over time. In just four weeks, 800 dolphins have run aground on the coast of the Bay of Biscay, a figure that is 30 times higher than what is considered the "normal" level of beaching in these animals, making this area one of the most Affected areas in the world. The problem is serious, as the Atlantic coast had not experienced a similar number since 1997. 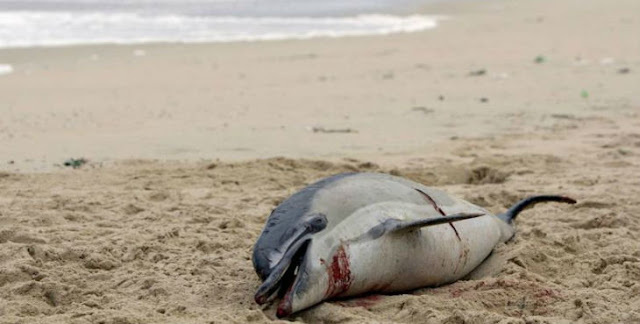 The bodies of dead dolphins on the coasts have been appearing since the beginning of this year, but especially in recent months there has been a record number of dolphin corpses washing up on beaches of Landes, Gironde, Charente and Vendée in France. Scientists are extremely concerned about this fact and have not stopped studying mammals since the beginning of events. They consider the annual loss of one percent of cetaceans constitutes a threat to the extinction of the species . In addition, they warn of the enormous inconvenience of not knowing the effect that the decline of dolphin populations will have on marine ecosystems. The main cause of all these deaths is attributed to the fishing methods used so far that particularly threaten these cetaceans. This is trawling , a type of industrial fishing consisting of huge nets, often with an opening similar in size to two football fields, which are dragged by two or more boats at both ends dragging all kinds of animals It finds its way. Trawling is mainly used for catching seabass, mackerel, mackerel, hake and bonito, and is extremely dangerous for dolphins, who seek out fish banks to feed themselves, end up entering fishing grounds, inevitably being trapped between the Networks. Fishing vessels, British, French, Irish, Dutch, Danish and Spanish who use these fishing practices are among the main responsible for the problem. All of them perform their fishing tasks in the English Channel, the Bay of Biscay and the Celtic Sea key points for cetaceans.